Beth Clark lives of the edge of an abyss. Everyday is spent fighting for her survival and the survival of her teen daughter, Genny. Their lives have been shattered by a vaccine that was supposed to have been a modern miracle. A vaccine that is turning the living into monstrosities of their former selves. Now, only remnants remain of their past lives. 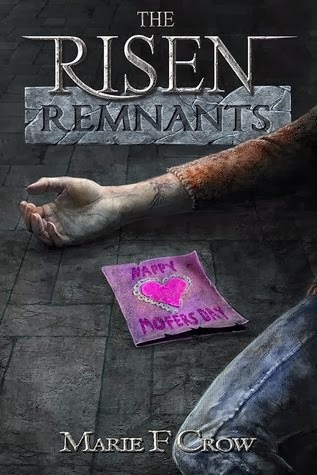 Mother and daughter will struggle to survive with what this new world holds for them as they discover the dawning of the Risen. When I found this little gem in the Amazon free section, I was unaware that it was actually the third book in an already established series. However (thankfully), this novel can (and does) act as a completely stand alone novel. You are given enough back-story to understand the "outbreak", and just what the world has become. I didn't find myself becoming lost or confused, and I have to say this is the first time a "zombie Apocalypse" book has MADE ME CRY. Lets back up for a minute shall we? The Risen: Remnants is one of those books that takes a concept that most will consider "overdone" or "gory", and makes it feel real. That isn't to say that this novel is not without its "gory" moments however, as I definitely wouldn't recommend it for those with a squeamish stomach, or anyone under the age of 15. However, there is more "depth" to the story than just the gore, and that in my opinion makes it worth reading. You gain an understanding for the characters, for their daily fight for survival and the lows they have undertaken in order to establish a sense of normalcy. The characters become real to you, you worry about them, your heart races for them, and you find yourself reacting to their plights more than you expected. I also thoroughly enjoyed Ms.Crow's take on "zombies". While I won't say too much as I don't want to spoil it for anyone who hasn't read the series, I will say that it was a refreshing take on a popular subject. All of that being said, I will definitely be checking out the rest of her series, as she has gotten me hooked!